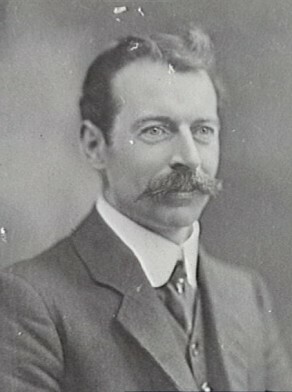 George McIvor was born in Glebe in 1873, son of George and Grace McIvor. In 1902 in Sydney he married Kathleen (Katie) H O’Brien and had two daughters and a son. He died at 34 years of age on 24 August 1907, survived by his wife. His well-attended funeral was held at St Patrick’s at Church Hill before his burial in the Catholic section of Rookwood Cemetery. George McIvor was educated at St Benedict’s School, Abercrombie Street. He served an apprenticeship as a hairdresser and established his own hairdressing salon in the Federation Buildings at 24 Grosvenor Street, Church Hill. He was closely identified with many Associations supporting the mental and physical development of young men. He was an executive member of the NSW Sporting League, a member of several football and swimming leagues, a member of the NSW Hurling Association and the NSW Band Association. He lived with his family in a Sydney Harbour Trust house in Gloucester Street. A public subscription was raised by his fellow Alderman to financially assist his widow and young children after his death. His wife was granted a lease on the Council’s baths at the Domain for the Refreshment Room. She also received a Council flat in Dowling Street, Woolloomooloo, which the family occupied until Mrs McIvor re-married in 1917. McIvor was an accomplished entertainer who performed recitations and miming for charitable causes. He was a member of the Australian Vaudeville Association, the Irish National Foresters, and of the Marine Banner RAOB. George McIvor was the Alderman for Gipps Ward, 4 June 1904 until his death on 24 August 1907. He was a member of the Health and By-Laws Committee in 1907, the Works Committee in 1904, and the Electric Lighting Committee from 1905 to 1906.